The Islamic faith has very definitive rules that must be followed in preparation and during the time of prayers. The question has arisen about the wearing of a pouch during the time of prayer. Mr. Mohamed Hanafy Ahmed, when is was the General Manager of ConvaTec, Middle East, petitioned Fatwa Commission of the AL-AZHAR University for a ruling. The Fatwa Commission is the official Islamic body governing such matters worldwide and is located in Cairo, Egypt. I am submitting an English translation of the official response as a service to ostomates of the Islamic faith worldwide. 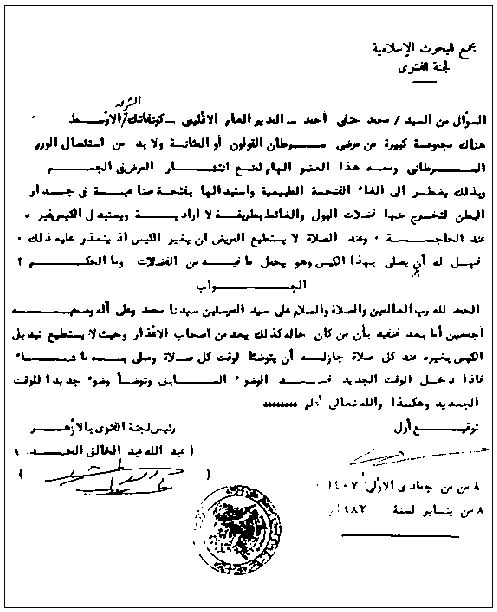 A copy of the original Arabic text is included for publication. "There is a large group of patients afflicted by colon and bladder cancer where the malignant tumor has to be removed together with the vital organ of the body so as to prevent the spread of disease. In such cases the natural opening of the body is by-passed and replaced by a stoma in the abdomen to work as an outlet through which urine or stool is emitted in an involuntary manner. Pouches used for collecting such matter are replaced when necessary. At the time of prayers, the stoma patient is unable to change the pouch. Is it possible for such a patient to pray while the pouch is carrying such excrements and what is the rule in such a case ?" Praised be Allah, Lord of all creatures and peace and prayers be upon the master of messengers Mohamed, his Kin and his followers. "Allah, Glory to be him is more knowledgeable than all."